Description: This paper describes comprehensive testing carried out in order to qualify Acktar Vacuum Black coatings for space applications. Outgassing tests consistently show very low values of CVCM. Elevated values of TML and WVR observed are attributed to water vapor captured as a result of the porosive morphology of the coating. An extended WVR test carried out indicates that approximately 96 hours are required for the surface to reach saturation. QCM and RGA tests further confirm that only water vapor is released (as opposed to organic/other contaminations that are released from paints) when the coating is exposed to vacuum. The overall outgassing is lower than that for paints as a result of the much smaller actual mass of the Acktar coatings (several microns thick) compared to paints (30-100 microns thick). Exposure to Atomic Oxygen does not alter the reflectivity of the coating or its adhesion to the substrate. In the framework of end-of-life tests small numbers of microcracks were detected. The adhesion of the Acktar coatings to a wide range of substrates is excellent and adhesive bonding can be performed directly on the coating. Acktars™ inorganic coatings are fabricated using Acktar™ proprietary vacuum deposition technology. A very high specific surface area coating is created with a tightly controlled morphology to produce a very low reflectance level. The coating thickness is a few microns (typically 3-5 μm) and its density is typically ~1.8 g/cm3. The deposition process is carried out at wide range of temperatures depending on the substrate. By controlling the composition and morphology of the layer microstructure it can be tailored to achieve desired levels of absorption or reflectance over a wide range of wavelengths. The coating performance is stable in a wide range of temperatures. The emissivity and absorptivity of fractal black was studied at temperatures in the range of 10 K to 300 K and was found to be very attractive . Under separate study performance after exposure to 2700C for 72 hours was evaluated. Adhesion and optical properties were found unchanged. In addition, coating withstood up to 1500 cycled of 77K-room temperature, and was found to be stable . Vacuum Black coating was found to be compatible with class 1 clean-rooms due to no particulation . Acktar™ offers several types of coating including, among others, Fractal Black, Magic Black, and Vacuum Black. Vacuum Black – which has the smallest thickness of the three, was thoroughly tested at ElOp and Soreq NRC in order to qualify its usage for space applications. Metal test samples were coated with Acktar™ Vacuum Black, Magic Black and Fractal Black coatings. The samples were made from 5 main types: Clear anodized Al 6061, sand-blasted Al 6061, sand blasted Ti-CP3, Ti-6Al-4V, and Ti-6Al-4V with Tiodize type II. For outgassing tests a 12 µm thick aluminum foil, coated on both sides with AcktarÔ Vacuum Black, was used. The optical reflectance of the coating was measured in the visible and NIR range (250-2000nm) using a spectrophotometer with an integration sphere configuration (Jasco 570V). The total reflectance (diffusive and spectral) was measured. The system was calibrated using a white reference. The tests were carried out in accordance with ASTM E-595 . The tests were performed on 12 µm thick aluminum foil, coated on both sides with AcktarÔ Vacuum Black. WVR values were determined after the standard 24 h and after 96 and 144 hrs. The outgassing criteria for space qualification are as follows: Total mass loss (TML) £ 1%, Collected volatile condensable material (CVCM) £ 0.1%, Retrievable mass loss (RML) £ 1% (calculated as RML=TML-WVR). Water vapor regain (WVR) is measured as an indication of water adsorption for use in calculating the RML value. To measure the kinetic parameters of the outgassing process, the outgassing system was modified by replacing one of the collectors with a gold-coated 15 MHz QCM crystal with a sensitivity of 6.21´10-10 g/Hz (QCM Research, Model MK10). The experimental method is described in mode details elsewhere . The following experimental procedure was applied: (1) a stepwise increase of the sample temperature from 75ºC to 125ºC, keeping the QCM at a constant temperature of 5ºC; (2) cooling the sample to room temperature while still maintaining the QCM temperature at 5ºC, so that re-evaporation kinetics of the contaminants is monitored; (3) increasing the QCM temperature stepwise to 15-25ºC to study the effect of the temperature on the re-evaporation kinetics of contaminants. The maximum pressure inside the vacuum chamber was always below 5´10-6 Torr. Residual Gas Analysis (RGA) measurements were carried out in a UHV system using a Balzers QME 200 instrument. The base pressure of the system at room temperature is 5×10-9 Torr. Exposure to thermal atomic oxygen (AO) was done in an RF plasma system (Litmas Model LB1200) equipped with an automatic matching unit and a power of 450 W . The operating pressure was 100 mTorr. The LEO (low earth orbit) equivalent atomic oxygen fluence was calculated based on the mass loss of a 125 µm thick Kapton HN polyimide reference sample. The erosion rate of Kapton was assumed to be equal to 3×10-24 cm3/atom and independent of the AO fluence. The average AO flux in the downstream position, ~120 mm from the RF plasma reactor edge, was estimated to be equal to 1×1015 atoms/cm2sec. Using this system AO fluences amounting up to 3×1020 atoms/cm2 were obtained. The 5 eV AO exposure was carried out using a laser detonation source in Montana State University. Under the operational conditions, a 5 eV AO flux of 3×1015 atoms/cm2sec was obtained . The total AO fluence was 2×1020 atoms/cm2. The atomic oxygen fluence was calculated based on the surface recession of Kapton as measured by step-height analysis using a Dektek 3 profilometer. Samples were characterized before and after AO exposure by various analytical techniques for analyzing chemical, morphological, and optical effects. The total reflectance was measured by a Spectrophotometer with an integration sphere configuration (Jasco 570V) (El-Op). The exposed samples were visually examined using a Leica MZ16 optical microscope at low magnifications (x7). SEM micrographs were obtained using a Quanta 200 FEI microscope in Low Vacuum mode, which enables measurements without the need of a thin conducting overlaying film. The adhesion test was performed in accordance with ASTM D 3359-97 , method B using two standard 3M tapes: Scotch tape #250 (rubber adhesive) / 3M Kapton tape #92 (silicone adhesive). The test is performed by scratching a net structure on the surface of the coating, applying a tape and attempting to lift the coating from the scratched area by lifting the tape. The adhesion quality is defined and graded (0B-poor up to 5B excellent) according to the number of squares or partial squares that are lifted from the coating. The Vacuum Black coated samples were cycled 97 times through temperatures of: -40°C to 100°C in a nitrogen environment. The heating and cooling rates were ~10°C/min and the samples were held for 30 minutes at the high and low temperature ends. The samples were tested for adhesion after thermal cycling using the adhesion testing method described above. After the thermal cycling the samples were analyzed using an optical microscope. Bonding onto Acktar coatings was tested in accordance with ASTM D 1002 . The substrate was Ti-6Al-4V and the adhesive was epoxy. Testing was done on a tensile testing machine (Instron model 4467), equipped with a load cell of 3 ton. The total (diffusive and specular) reflectivity of two types of Acktar coatings over the wavelength range is shown in Fig. 1. The reflectivity of both Magic Black and Vacuum Black is below 3% in the visible range (400-700nm). Fig. 1. The total reflectance of Vacuum Black and Magic Black coatings as a function of wavelengths. These reflectivity values are highly competitive with typical reflectivity values of black paints qualified for space applications in a similar range of wavelengths. Measurements of the standard outgassing parameters are summarized in Table 1. The TML values exceed the requirements of ASTM E 595. The high values of WVR indicate that the main outgassing product is water vapor. This is supported by WVR measurements made as a function of time (after 24h, according to the standard and after 96h and 144h). The data (see Table 2) indicate that the WVR value increases with time (while RML decreases), most likely due to absorption of water by the porous structure. The overall outgassing per unit of coated area is equivalent to or lower than that of alternative options such as paints, which are usually much thicker (30-100 mm). Additional experimental support for the water vapor explanation is provided by the significant difference between the TML and WVR values for test #2 as compared with those for test # 1 , 3 and 4. This difference is attributed to the fact that, unlike the others, sample #2 was put in a sealed package after coating and was thereafter not exposed to humidity conditions for any significant length of time. The extended WVR experiment showed that the coating requires about 96 hr to reach saturation and the fact that the sample was kept completely dry prior to the outgassing test is understood to be the reason why it did not have sufficient time to absorb water. The TML and WVR values were accordingly low. Table 1. Summary of the outgassing tests of different Acktar coatings. Kept in a sealed package. In Fig. 2 the accumulated QCM mass change is shown as a function of process time. The mass change is normalized to 100 mg of the outgassed material. The graph is divided into two parts: the outgassing phase, when the studied material is heated, and the re-evaporation phase, started at time t1 when the heating is terminated and the sample is cooled down to room temperature. The accumulated QCM mass sharply increases at the beginning of each heating step. The sharp increase at 75ºC is followed by a decrease in the QCM mass after less than an hour. Heating to 100ºC and 125ºC results in a negligible increase of the QCM mass, which then quickly decreases. Quantitative analysis of the QCM curves in Fig. 2 shows that the outgassing of the Acktar black coating induces very low QCM mass growth: ~ 0.15 μg in total, although the QCM was kept at 5ºC, as compared to 25ºC for the standard outgassing test. Such a low mass accumulation on the QCM is not surprising bearing in mind the inorganic nature of this coating. On the right hand side of Fig. 2 (t > t1), the QCM curve of the re-evaporation phase is shown. The accumulated QCM mass rapidly decreases when the QCM is still kept at 5ºC. From the rough extrapolation of the curve it can be seen that only traces of the contaminants would remain after sufficiently long time. Increasing the temperature to 15 and 25ºC accelerates the contaminants desorption process and results in almost total elimination of the contaminants within a few hours. Fig. 2. The accumulated mass on QCM with process time (heating and cooling). The species outgassed from an Acktar Vacuum Black coating when heated to 175°C in a clean ultra high vacuum chamber are shown in Fig. 3(a). The predominant and the only significant outgassing species is water vapour. The characteristic water vapour spectrum is readily identified by the signal peaks at masses 16, 17 and 18 amu. In addition the hydrogen mass peaks at masses 1 and 2 amu are fragmentation products from the water vapour. Two small peaks are observed at the mass positions of 28 and 44 amu, corresponding to CO and CO2. These are most probably created by the reaction of water vapour on the filament of the RGA ionizer. The small carbon peak at mass 12 is a fragmentation product of CO and CO2 in the RGA ionizer. Other species outgassed from the heated Acktar Vacuum Black sample are orders of magnitude smaller than those derived from the water vapour. It is noted that below 100°C the outgassing from Acktar black is very low and increases rapidly with temperature above 115°C, Fig. 3(b). High concentration of the water vapor released is in good agreement with the results of the outgassing test and WVR measurements as a function of time, shown above. Fig. 3. RGA measurements of the outgassing from Acktar Vacuum Black coating. Typical spectrum at 175ºC (a); outgassing products as a function of temperature (b). The Fractal Black coating was exposed to thermal AO using an RF plasma simulation facility which is considered to be a more severe exposure environment than the 5 eV AO experiment described below. The average AO flux in the downstream position, ~120 mm from the RF plasma reactor edge, was estimated to be equal to 1×1015 atoms/cm2sec. Using this system AO fluences amounting up to 3×1020 atoms/cm2 were obtained. The results of optical tests, surface morphology studies and chemical composition measurements were similar to those obtained after 5 eV AO exposure. Fig. 4 shows total reflectance of fractal black coating before and after exposure to RF plasma (LEO equivalent AO fluence of 3x1020O/cm2). Fig. 4. 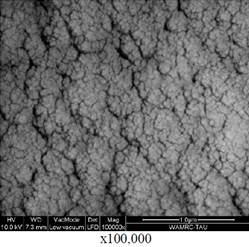 Total reflectance of fractal black coating before and after exposure to RF plasma (LEO equivalent AO fluence of 3x1020O/cm2). Under the operational conditions, a 5 eV AO flux of 3×1015 atoms/cm2sec was obtained. The total AO fluence was 2×1020 atoms/cm2. The samples were characterized before and after exposure to atomic oxygen by several characterization methods. The total reflectance did not change due to the exposure to AO and was kept below 2%. There was also no change in its visual appearance. The total reflectance over the wavelength range before and after exposure to AO is shown in Fig. 5. Fig. 5. 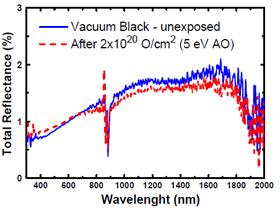 Total reflectance of Vacuum Black coating prior and after exposure to 5 eV AO (2×1020 atom/cm2) with a Laser Detonation Source (the peak at 900nm is due to lamp change in the spectrophotometer). 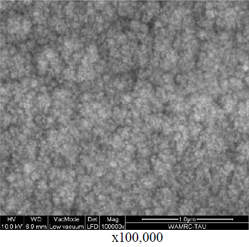 The surface morphology of the Acktar coating was modified slightly after exposure to 5 eV AO as observed in Figs. 6-7 by HR SEM microscopy. A number of micro-cracks were found on the surface with a typical width of 0.5 µm and the granular structure of the surface was slightly smoothed. The micro-cracks were most probably formed after exposure to AO similar to end-of-life exposure. No peeling or flaking was observed. Fig. 6. SEM images of unexposed Vacuum black sample. 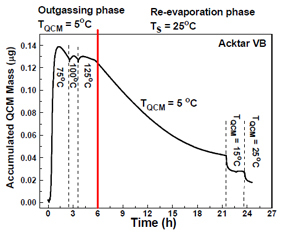 Adhesion tests for Acktar Vacuum Black on several substrates were performed – before and after thermal cycling (97 cycles at a temperature range of -40°C – 100°C). The adhesion of the coating to all substrates was shown to be excellent – not a single square having been lifted – corresponding to Class 5B according to Fig. 1 in ASTM D3359-02 . After the thermal cycles the morphology of the Acktar Vacuum Black coating was studied using an optical microscope. No cracks were observed after the thermal cycles. The reflectivity of the Acktar Vacuum Black was not affected. Bonding to a coated Titanium (Ti-6Al-4V) sample was tested by preparing lap shear samples per ASTM D-1002  Bonding was tested with an epoxy adhesive. Thickness of adhesive was 0.25mm The lap shear strength for coated samples was compared with that for bare samples. The results displayed at Table 3 show that the adhesion of the adhesive to the Acktar coating is not inferior to its adhesion to the bare substrate. The results also show the excellent adhesion of the Acktar coating to the substrate. Table 3: Lap shear tests results with Epoxy adhesive. Three types of Acktar coatings were tested: Fractal Black, Magic Black, and Vacuum Black. Vacuum Black was thoroughly tested in order to qualify its usage for space applications. Its optical properties, outgassing behavior, morphology and chemical composition were studied on various substrates. Its morphology and optical properties were studied before and after exposure to high fluxes of AO and to thermal cycling. The measured total reflectivity of the Vacuum black coating is very low and is below 2% in the visible and NIR range. The Vacuum Black coating has negligible outgassing potential, especially when compared to black paints. The Acktar coating is highly porous and under ambient atmospheric conditions can accumulate amounts of condensed water leading to non-compliance with the TML and RML criteria of ASTM E595. This effect is cancelled by carrying a baking process of 2 hours at 180°C in a vacuum environment in order to evaporate the trapped water. The stability of the baking effect with time was not tested and therefore should be taken into account in applications where small quantities of outgassed water could be problematic. After outgassing more than 24 hours under ambient atmospheric conditions are required to regain the amount of water lost in outgassing. Taking into consideration the small thickness (and mass) of the coatings – the absolute mass of outgassed material per unit of coated area is very small. Mass spectroscopy measurements of Acktar outgassing do not show desorption of components other than water vapor. 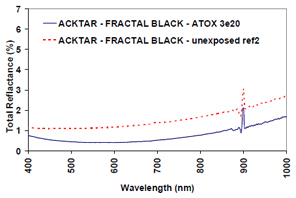 The Acktar black coating was found to be chemically stable under AO exposure up to 3x1020O/cm2. Total integrated reflectivity was not affected by AO exposure. No peeling or flaking was observed. The surface morphology was slightly modified after AO exposure (probably after end-of-life similar exposure), showing a smoother surface and some micro-cracks (about 0.5µm width). These micro-cracks could compromise the efficiency of a protective coating on polymeric substrates such as Kapton, or on composite materials due to undercutting of the substrate by AO. 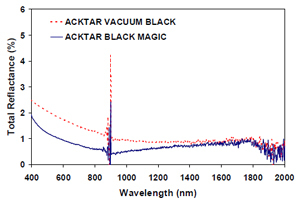 Acktar Vacuum Black coating was found to be thermally stable between -40°C and 100°C in terms of its morphology and reflectivity as was observed by an optical microscope and a spectrophotometer, respectively. Bonding directly on Acktar coating is practical. The adhesion of the adhesive to the Acktar coating is high and not inferior to its adhesion to the bare substrate. The adhesion of Vacuum Black coating to the substrate was found to be excellent and show no sign of peeling (according to Class 5B according to Fig. 1 in ASTM D3359-02). Acktar Vacuum black coating can be used in space applications. The tendency of the coating to adsorb water should be kept in mind. Kralik T., Katsir D., Black surfaces for infrared, aerospace, and cryogenic applications, Proceedings of the SPIE, Volume 7298, pp. 729813-729813-9 (2009). ASTM-E-595-93, Standard Test Method for Total Mass Loss and Collected Volatile Condensable Materials from Outgassing in a Vacuum Environment, Vol. 15.03, pp. 586-592: ASMT International, 2002. Laikhtman A., Gouzman I., Verke R. et al., Contamination Produced by Vacuum Outgassing of Kapton Acrylic Adhesive Tape, Journal of Spacecraft and Rockets, Vol. 46, no. 2, 236-240, 2009. Intrater R., Lempert G., Gouzman I. et al., Simulated low Earth orbit environment interaction with different types of polyethylene, High Performance Polymers, Vol. 16, no. 2, 249-266, 2004. Minton T. K., and Garton D. J., “Dynamics of Atomic-Oxygen-Induced Polymer Degradation in Low Earth Orbit,” Chemical Dynamics in Extreme Environments (Advanced Series in Physical Chemistry), R. A. Dressler, ed., pp. 420-489, Singapore: World Scientific, 2001. ASTM D-1002, Metal specimens, single lap joint adhesively bonded, by tension loading (metal to metal), apparent shear strength.